Hamilton Beach’s Multiblend Blender & Food Processor takes up the space of just one gadget in the kitchen, outfitted with a sturdy base and two attachments (a blender for smoothies and food processor for all your grating and chopping needs). 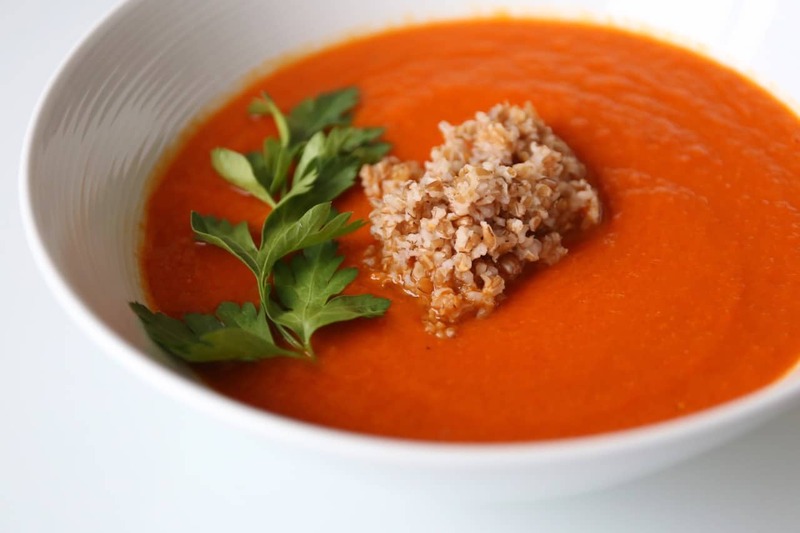 For this spicy carrot and sweet red pepper number I used the food processor to grate a pound of carrots (saved my fingers from shredding on my cheese grater) and once the soup had cooked to perfection I added the pots contents to the blender and zipped into a smooth, aromatic soup. Topped with hearty bulgar wheat and fresh parsley, you’ll spoon through a flavourful bowl without any of that gluttony guilt. Heat a large pot over medium high heat. Add oil, garlic and onion. Cook until lightly browned around 5 minutes, then add the peppers. Cook until they begin to soften, around 10 minutes, then add the grated carrots and cook for another 5 minutes. Add the spices and cook for a minute more. Pour in the broth and salt and simmer. Cover, and simmer over low heat until the carrots and peppers are tender, around 25 minutes. Pour the contents of the pot into your blender and puree the mixture until smooth. Add the piri piri, to taste. Ladle soup into bowls. Top with cooked bulgar wheat and fresh parsley.